Solpac offer a wide range of customised packaging solutions, we specialise in tailoring solutions to specific customer requirements. The following information provides an overview of some of the ‘types’ of solutions we are able to offer. We offer Stillages and steel solutions for all your manufacturing needs. Using standard industry design or a full design & process management solution working towards your bespoke production needs. All stillage’s can be fittings with a combination of textile bags, poly prop systems, polyurethane moulding, wheels or skids. CAD details can be used to produce full drawings and pre-production sample even before parts are available, this enables process and usability of the solution to be accessed prior to full production. Euro containers, or KLTs, are used in situations where space is limited or there are many variants and volumes are small. Velcro is the simplest method of attaching dunnage to a Euro / KLT but can only be used when the parts are very light, this fastening method does have a limited life. 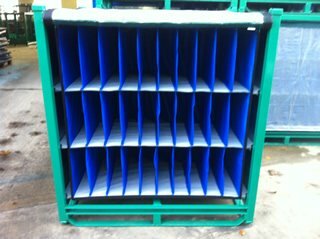 Using a Correx (corrugated plastic) structure allows the dunnage to fold enabling it to be used with a folding Euro / KLT. It also allows the full width of the box to be utilized. For a more durable solution the dunnage can be supported on fiberglass rods which creates tension between the dividers, enabling multiple layers to be used. 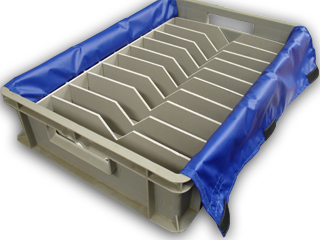 The most common container we put dunnage into is an FLC (Folding Large Container). 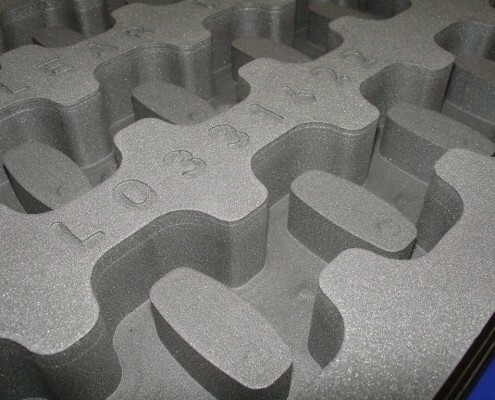 They have a footprint of 1200×1000 or 1500×1000 for an E FLC (Extended Folding Large Container). 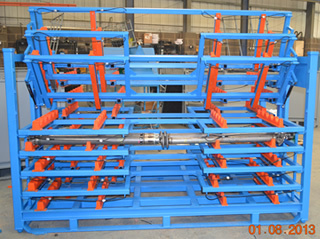 Dunnage is supported on spring steel bars which creates tension between the dividers. 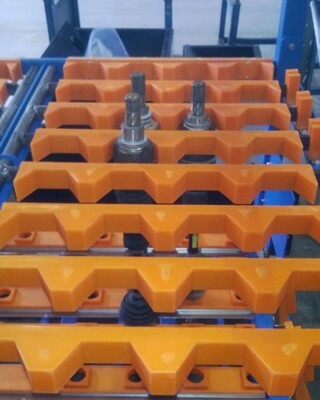 These can be removed and placed in the base allowing the FLC to fold down to maximise return transit quantities. 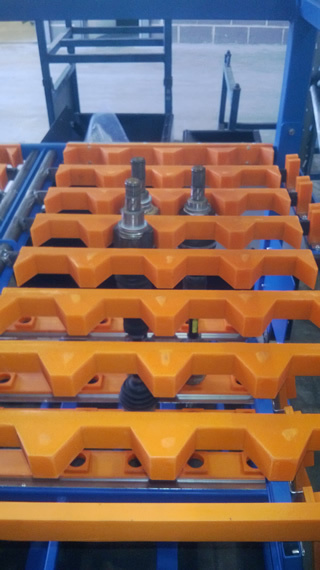 Using this system allows the parts to nest together improving pack density beyond any other packaging method, whilst still retaining the outer protection from the FLC. 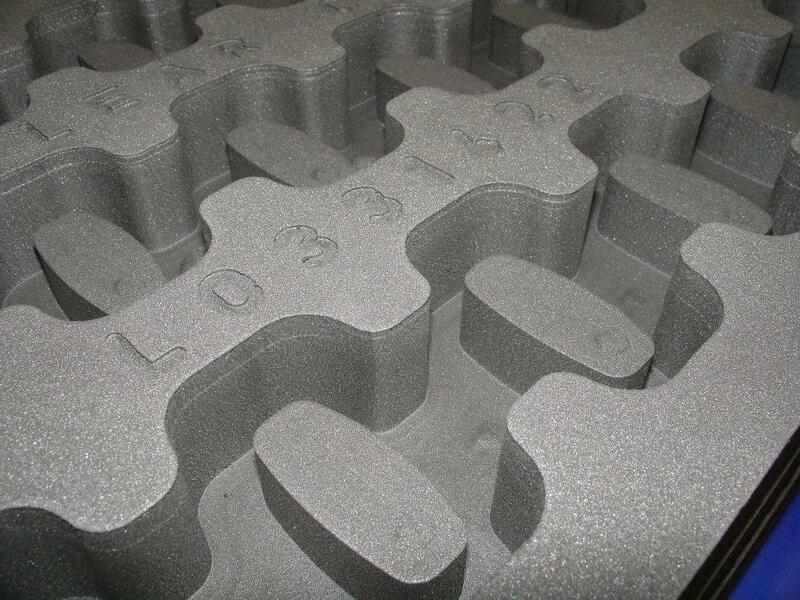 We can produce sculpted foam trays for smaller parts, for use with 400×300, 600×400 or 800×600 euro containers. 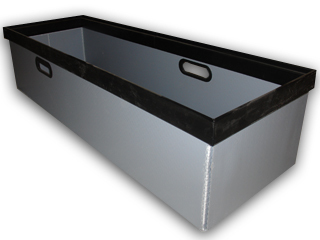 We supply fixed dividers for parts that are particularly heavy or have sharp edges. Non standard containers of any size are fabricated from tough Triplex sheet material incorporationg stacking rims and handles. Our repair and maintenance service ensures maximum life span for all returnable packaging products. We have a team of skilled plastic welders and together with our inspection and quality control systems we can offer a service allowing your company to maintain a fleet of expensive pallets and boxes which may have other wise been scrapped. Non standard containers can be produced by fabricating multiple containers together. Solpac can also carry out a full inspection and service scheme for metal stillages. We understand company’s cannot allow large numbers of container to be out of service at any one time so an initial “feeder” volume is produced, these replace the containers taken out of the loop for refurbishment, this then repeats until all units are complete. At the end of a project often perfectly serviceable stillages are mothballed simply because the pocket or divider is not suitable for the next generation. Solpac offer a cost effective solution to refurbish where needed and supply a redesigned system. We can also carry out a refurbishment service on all textile packaging, this will involve a thorough inspection for any damages, cleaning of the packaging if necessary and replacement of items needed.